We are very happy to invite you to the release concert for our long awaited EP «KINSHIP» !! Where? At the wonderful Maschu Maschu, Neubaugasse 20, 1070 Wien (downstairs) where you can listen to the best music and have the best food in town! Everyone who suppported our wemakeit campaign: voluntary donation. You can now listen to the EP on all online platforms! Dear supporters, friends and family! We put a lot of hard work and effort into this record, which was made possible thanks to you! Without further ado, here we go: click the dropbox link below and enjoy! -registering songs for copyright -registering for AKM (Association for Musicians, Writers and Labels) -licensing of record label -printing CD’s -recording audio cassettes -getting it out there! Due to your trust and believing in this Trio, we can make this record possible. Just a little bit more patience and we will soon be there! 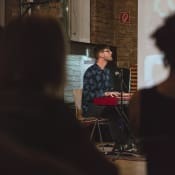 We will play an unplugged set on Thursday 07.06. at the Spittelberg-Passage as part of Open Piano for Refugees, at 19:00! Come out, enjoy the music and donate for a good cause! Thanks to everyone who’s been supporting our latest project! It’s been one heck of a ride last week and we still got 32 days to go! :) Thanks to your help, we now get support from the #Bankaustriacrowdfunding initiative woop! We’re getting closer to our goal each day.